Patients in the Rancho Peñasquitos area know that we offer straight talk and honest answers when it comes to dental care matters. For a number of cosmetic issues, we will often discuss the use of porcelain veneers, a gamechanger when it comes to cosmetic dentistry. The results are so good that some people have nicknamed porcelain veneers "instant orthodontics". Let's explore why porcelain veneers is considered "instant orthodontics", and compare this cosmetic dentistry innovation to traditional approaches for straightening your smile. Porcelain veneers are thin shells of dental ceramic that are adhered to the fronts of the teeth. These cosmetic shells essentially mask cosmetic imperfections from view, making a person's smile look absolutely perfect. The porcelain veneers are quite durable, and are able to withstand the normal wear and tear the teeth experience without coming loose. The best thing about porcelain veneers is that they are semi-transluscent, meaning that light partially passes through them much like traditional tooth structure. When in place, porcelain veneers are indistinguishable from your normal teeth, allowing you to smile with great confidence. So long as the problem is cosmetic in nature, porcelain veneers ought to be able to do the job. Entire smile makeovers can be achieved using porcelain veneers alone. Porcelain veneers have been referred to as instant orthodontics because the results can be as dramatic as orthodontic work. The difference is the timeframe. Traditional orthodontic treatment can take months (and sometimes even years) to complete. Braces, headgear, palate expanders, and other orthodontic appliances can take time to work properly, requiring many follow up visits and often additional care. With porcelain veneers, there are only two visits required, and only about a week apart. Compared to several months of orthodontic care, seven days to complete porcelain veneers treatment is a relative instant. 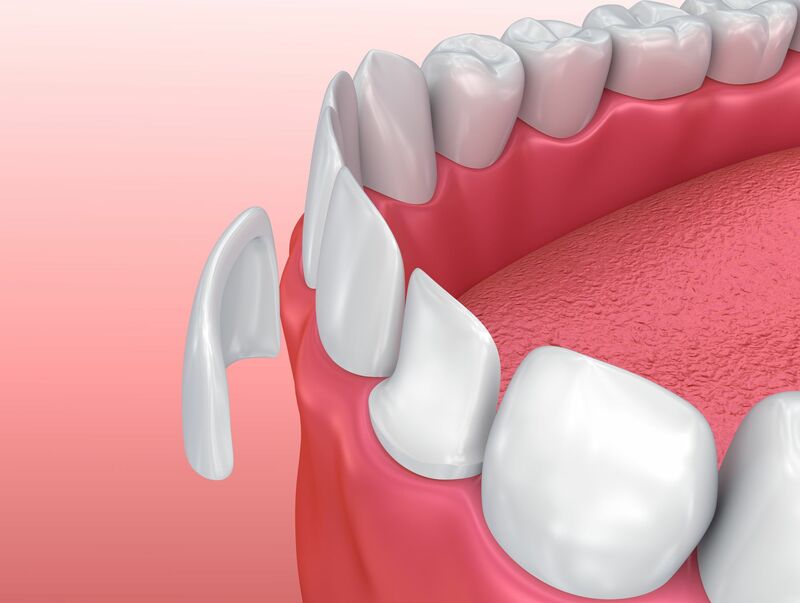 For very minor cases of crooked teeth or dental misalignment, porcelain veneers may yield results comparable to orthodontic care, and achieved in a much shorter amount of time. For aesthetic flaws with a smile, porcelain veneers is often the way to go. However, when tooth misalignment impacts your overall dental wellness, traditional orthodontics is more ideal. Only orthodontic care will be able to properly improve the alignment of your teeth, the position of your jaw, and/or the shape of your dental arch. In the process of straightening your smile, orthodontic treatment can prevent a number of dental health issues later in life as well. Are Porcelain Veneers the Right for Me? The best way to learn if porcelain veneers are ideal for you is to stop by the practice for a consultation. During your visit, we can assess your situation and determine if cosmetic treatment or orthodontic care is better suited to address your needs. We will develop a treatment plan that helps you have smile that looks great and is far healthier as well. For more information about porcelain veneers and how they can help you smile with renewed confidence, be sure to contact our cosmetic and restorative dentistry center today. The team at our practice will help you make smart choices about your dental care options.